Despite the myriad uses an iPad can serve up, one area where it falls short is artistic creation. Sure, there are tons of sketching and painting apps, but they are hampered by one shortcoming of the iPad's display: lack of pressure sensitivity. The Pogo Connect Stylus tries to mend this gap and open the doors to a more complete artistic experience on the iPad. An $80 iPad stylus that uses Bluetooth to introduce pressure-sensitivity and a few other features to compatible apps. Sketching fiends, illustrators, note-takers—anyone looking for a more authentic "pen-to-paper" experience from their iPad. Looks nice and sleek, and matches the silver and black tones of your 'Pad. There's a button on the side that acts as an "undo" in most apps. The stylus is cartoonishly fat, as is necessary to house a AAA battery, and the barrel is quite slippery with no clip. It looks nice, but we would have liked to see more practical considerations. Setting up the Pogo is as easy as downloading a free pairing app and pressing a button to connect. Each third-party app that is compatible with the Pogo has its own setting for connecting to the stylus, but in our use it was usually very simple, and the pairing never faltered. There are about 15 compatible apps, with a handful more filed under "coming soon." Drawing with the Pogo is a mixed bag. It delivers on its promise of pressure-sensitivity only with some heavy caveats. The most frustrating part is that unlike a regular stylus or finger-tip, you actually need to put pressure on the Pogo for it to register a line. If you simply place the tip on the iPad's display and wave it around without pressing down a decent amount, your lines won't appear. This is extremely awkward to get used to, and kind of defeats at least some of the purpose of the pressure-sensitivity. Another roadblock to greatness is the blatant non-functional palm-rejection feature. The Pogo is supposed to let you place your palm on the iPad while drawing, without the display registering it and interrupting your strokes. In all the apps we tested that advertised compatibility with this feature, palm rejection didn't work at all—plain and simple. The satisfaction of watching a line go from thick to thin on your iPad is powerful, and adds a whole other strata of possibilities to an already useful tool. Without the Pogo, the thickness of your line increases with speed—which doesn't make much sense. It just doesn't work well enough. When drawing, LACK of pressure is just as important as pressure. The Pogo's inability to register those light and delicate strokes is surely the gadget's Achille's Heel. The button on the Pogo lies just where your thumb rests when writing or drawing, lending itself to a whole lot of accidental presses. We mainly tested the Pogo with Adobe Photoshop Touch, GoodNotes, and Paper. The Pogo's tip is replaceable should you wear it out. Ten One Design also claims that the top is upgradeable, though no specific upgrades have been announced yet. Ten One Design claims that the Pogo "supports hundreds of levels" of pressure-sensitivity. This doesn't mean that hundreds of levels are being utilized, or that apps are capable of it. As much as we like the idea, the Pogo Connect just feels too incomplete to spend $80 on. We didn't expect it to compete with the power and versatility of a Wacom tablet, but it should be able to deliver more core functionality. 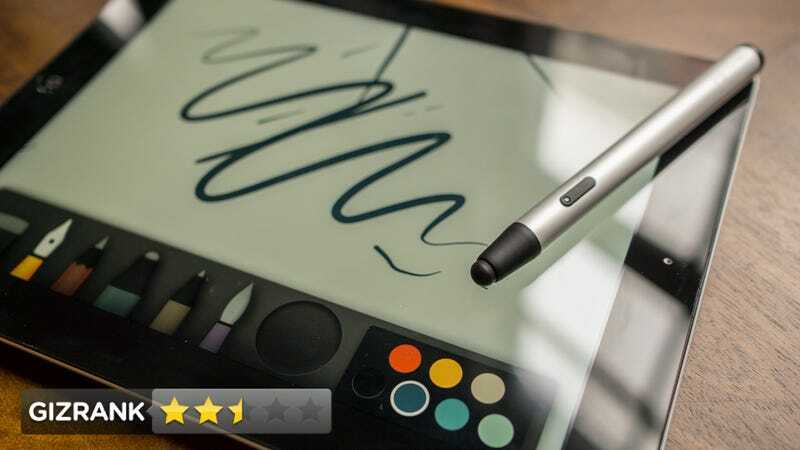 If you are a casual sketcher, the Pogo can be a lot of fun, but if you are looking for a tool that will recreate the subtelty and dynamics of drawing, you may be disappointed.